Waiting for that weather window. 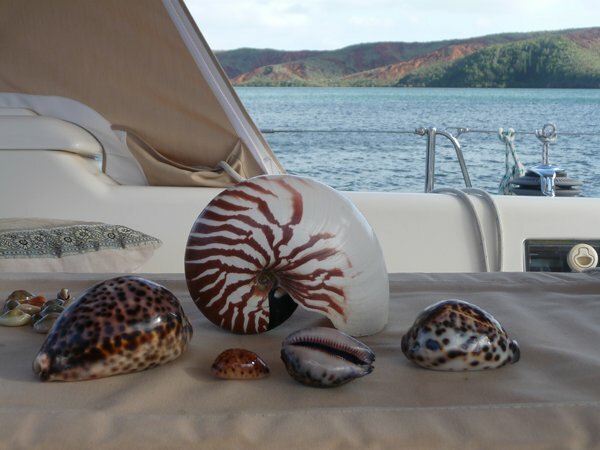 We have almost circumnavigated New Caledonia, anchored in nearly 40 different locations and have seen about a dozen other yachts. This area is remote and beautiful; the Northern lagoon in particular is the perfect get-away-from-it-all cruising area. Unlike the rest of the Pacific Islands the Local people, the Kanaks do not paddle out to trade for T-shirts. There are local markets in the villages but the pickings are lean, nothing much more than a few bananas, plantains and manioc. Occasionally you may find the odd squash or if you are lucky a bag of green beans. But what you can be sure of is that the local market ladies will be playing Bingo! We found the people to be very friendly and welcoming once you have made contact. Speaking a bit of French is essential. We only visited one of the Loyalty Islands and wished we could have spent more time in the Northern Lagoon but we were down to the last two bottles of wine. Inspite of everyone telling us that the fishing was great, we had little luck. Either we caught something so big it broke the line or we caught only something called Tazard, a sort of bonito/mackerel looking fish with flesh coarser and darker than horse meat. Some of the locals eat it and others tell us that it is full of la gratte or ciguatera to us. Shelling and beach combing in general was fantastic. There is one beach where the nautilus shells almost out number the plastic bottles! Snorkelling was good in parts but the water is quite cold at this time of year. We are waiting in Noumea for the right weather window to get back to New Zealand. When we return I will post up a selection of our best photographs. At the moment we are using the phone so here is a photo of our best shells.